Ideally suited for mounting printed circuit boards horizontally (for our internal ribbed enclosures - designed for vertical board mounting - link to our 1591 FL series). 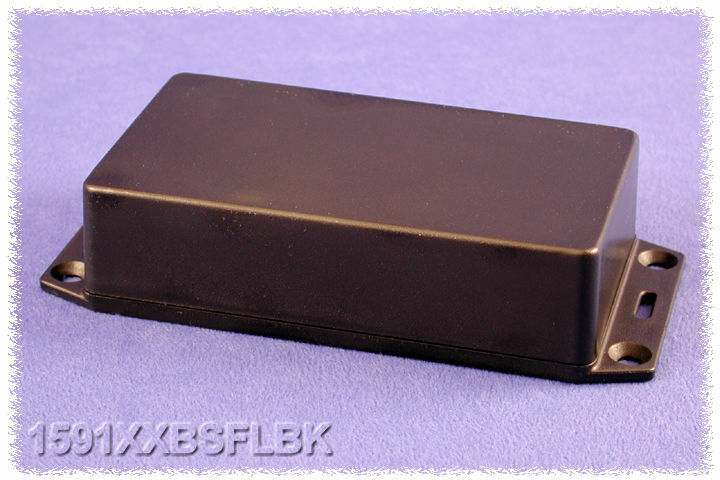 Flanged lid is perfect for wall or shelf mounting and enclosure security. Internal sides of enclosure are smooth for easy connector installation (see photos) - except for the largest enclosure the 1591XXFL size which is a universal type (ie...includes P.C.board standoffs in the lid and enclosure PLUS includes card guides (see drawing and/or photo table for more details). Strong - tongue and groove lid to box construction provides protection against access of dust and splashing water. Lid and box both contain - molded in PC board standoffs. Molded from easy to machine, economical black plastic, with a satin texture. 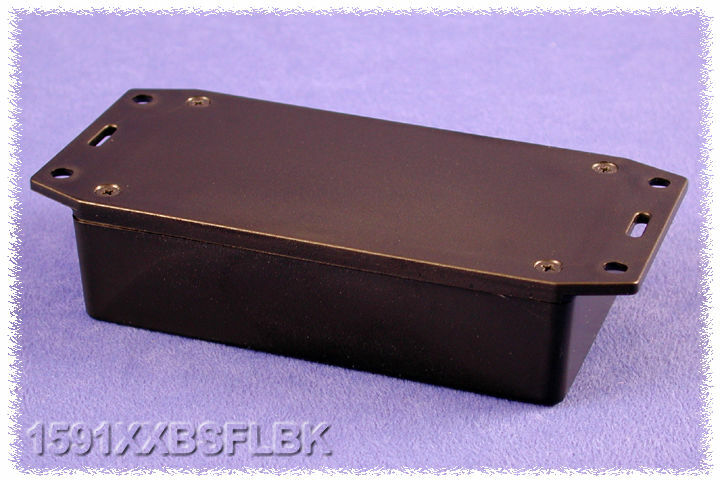 Link here to our flame retardant ABS plastic version of these enclosures. Lid is secured with black self-tapping #4 x 0.5” philips screws. Link here to photo tables of each part number. Dimensions (above) are for enclosure (ie..length does not include flanged lid). Add lid thickness of 0.12" (3 mm) to enclosure depth for total outside depth. Accessory screws for mounting P.C. boards into standoffs (#4 x 1/4" pan head) P/N 1593ATS50 (qty. 50), P/N 1593ATS100 (qty. 100). 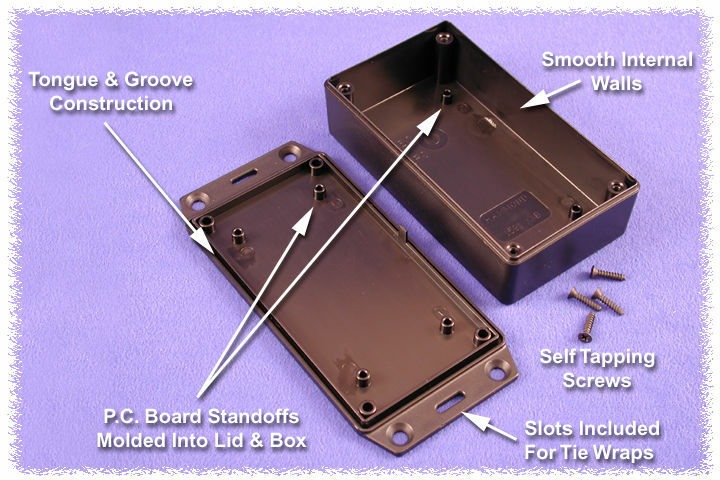 Internal construction is different for the 1591XXFSFLBK (ie...includes P.C.board standoffs in the lid and enclosure PLUS includes card guides (see drawing and/or photo table for more details).